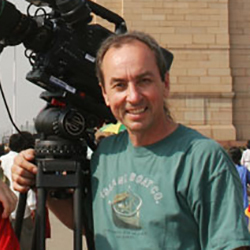 Bongo has been working as a freelance lighting cameraman/Director Of Photography and multi camera operator since 1984. He continues to work worldwide on projects for broadcasters including CBC, CTV, TVO, PBS, NBC, ABC, CBS, Swedish TV, CCTV(China Central) GDTV (China GuanDong TV Network), KRO TV (The Netherlands), Global, Showtime & The Discovery Channel. Bongo is also very active in the local arts, ranging from theatre to dance and video art. His involvement with VideoCabaret International began in 1982 and spans many productions which he has recorded and archived over the last 30 years.